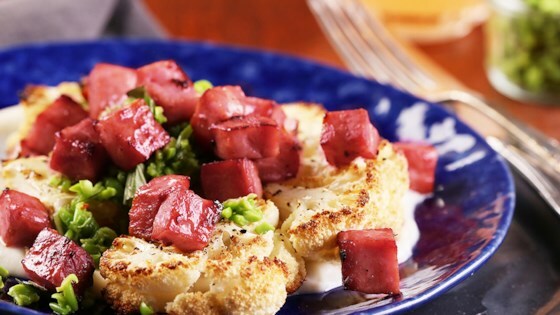 "Combine our savory, sweet ham with roasted cauliflower for veggie side-dish perfection." Brush cauliflower steaks with oil and season with salt and pepper. Bake for approximately 10 minutes. Add ham to baking sheet and cook for 5 more minutes, or until cauliflower is browned. In pot of salted boiling water, cook remaining cauliflower scraps until soft. Transfer to blender. Add Gouda and puree until smooth and creamy. Thin with cooking liquid if necessary. To serve, plate cauliflower cream on bottom. Top with roasted cauliflower steak. Add 1/2 cup Smashed Pea Pesto and ham; then garnish with smoked paprika. For pesto, combine all ingredients in the food processor. Season with salt and pepper to taste. This recipe was hard to follow so I made quite a few changes, but overall it was very tasty and a great idea. My family enjoyed it.